Canada has been the favourite destination for worldwide immigration aspirants since long. Soft immigration policies, multiple job opportunities, enhanced infrastructure, and high standards of living in Canada lure and invite a huge number of immigrants every year from various developing and developed countries of the world. However, in the year 2017, there are even more reasons to immigrate to Canada. The federal government of Canada has announced several relaxations in the immigration rules for the Canada immigration applicants to make immigration to Canada smooth and trouble free in the year 2017. Canadian government has planned to invite 300,000 new immigrants in the year 2017. The government has increased the target for immigration through economic immigration program and Provincial Nominee Program (PNPs). It means, in the year 2017, more skilled workers will be allowed to come to Canada compared to last year. Certain Canada immigration applicants, who have got Canadian job offer without LMIA approval, will also get the CRS Points in express entry system, i.e. Candidates with a work permit issued under the ‘significant benefits to Canada’ criteria, i.e. Intra-Company Transfers. Candidates with a work permit issued under an international agreement, i.e. North American Free Trade Agreement (NAFTA). The Immigration Refugee and Citizenship Canada (IRCC) has extended the period of submitting visa application to 90 days after the ITA (invitation to apply) has been issued by IRCC. Earlier, this period used to be 60 days from the date of issuance of ITA from IRCC. Now the applicants will get more time to gather the essential documents and fill the visa application accurately to submit the same to the immigration office. Family reunification processing time has been reduced to 12 months from 24 months by the Immigration Refugee and Citizenship Canada (IRCC). The earlier processing time of 2 years was very long. Hence, family members of Canadian citizens and family members had to wait for a long time to reunite with their relatives in Canada. Now reduced processing time will benefit the thousands of applicants coming to Canada on family-sponsored visas. As per the announcement from government, the international students in Canada, who are looking to apply for Canadian permanent residency, will get points in express entry for their Canadian education credentials. The government has removed the ‘Four in, four out’ policy that used to deny certain temporary foreign skilled workers to stay in Canada beyond their employment contract period and apply for permanent residency. 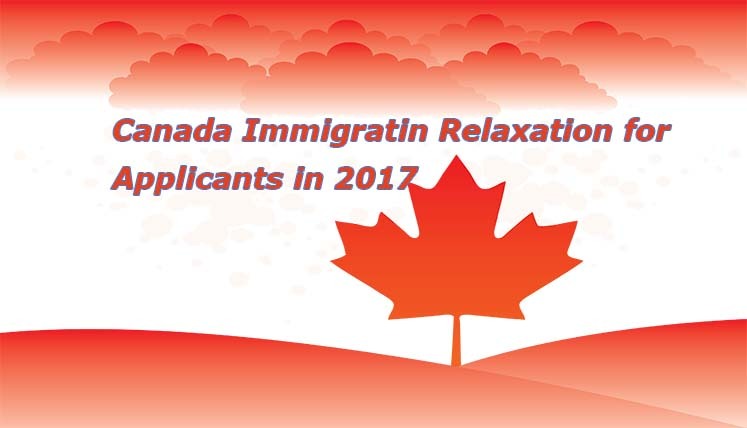 With all the above relaxations in the immigration rules, Canada immigration will really smooth and hassle-free in 2017. If you have plans to immigrate to Canada, this year is the best time to apply for the same. So, get in touch with a reliable immigration consultant to prepare your immigration file fast and apply for relevant immigration program at earliest. If you seek assistance and support to apply for the Canadian visa in the year 2017, you may coordinate with Visas Avenue Immigration. Visas Avenue is a certified Visa Consultancy Company in India with dedicated Visa Consultancy offices in Delhi, Bangalore, and Hyderabad. To speak to the expert at visas Avenue, you may call at 011-48447777, 011-46194650 (Delhi), 080-46668222 (Bangalore), or 040-42467777 (Hyderabad). You may also choose to forward your immigration associated queries and feedback through email to Visas Avenue email id- info@visasavenue.com.